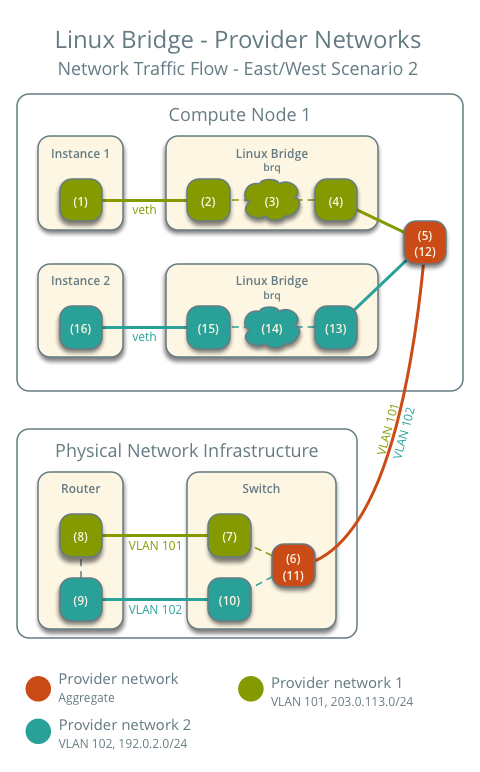 The provider networks architecture example provides layer-2 connectivity between instances and the physical network infrastructure using VLAN (802.1q) tagging. It supports one untagged (flat) network and up to 4095 tagged (VLAN) networks. The actual quantity of VLAN networks depends on the physical network infrastructure. For more information on provider networks, see Provider networks. Two network interfaces: management and provider. OpenStack Networking server service and ML2 plug-in. 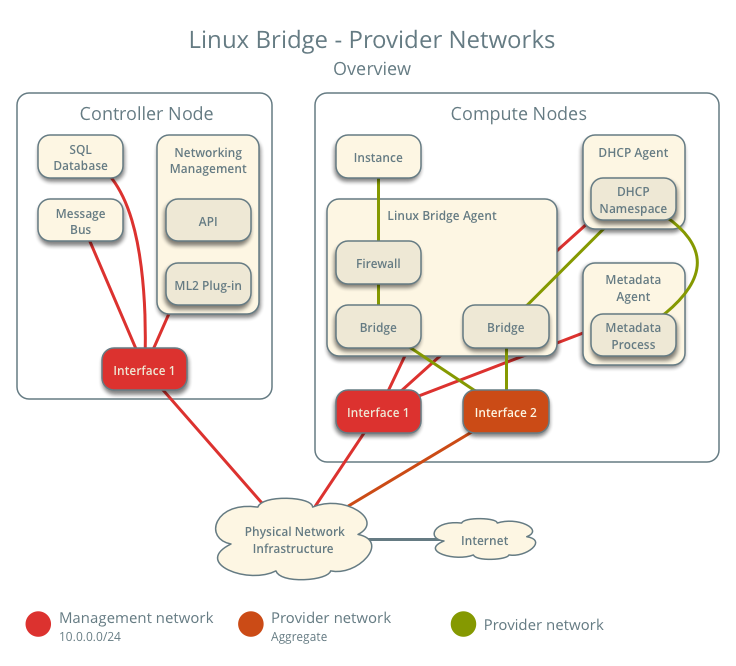 OpenStack Networking Linux bridge layer-2 agent, DHCP agent, metadata agent, and any dependencies. Larger deployments typically deploy the DHCP and metadata agents on a subset of compute nodes to increase performance and redundancy. However, too many agents can overwhelm the message bus. Also, to further simplify any deployment, you can omit the metadata agent and use a configuration drive to provide metadata to instances. The following figure shows components and connectivity for one untagged (flat) network. In this particular case, the instance resides on the same compute node as the DHCP agent for the network. 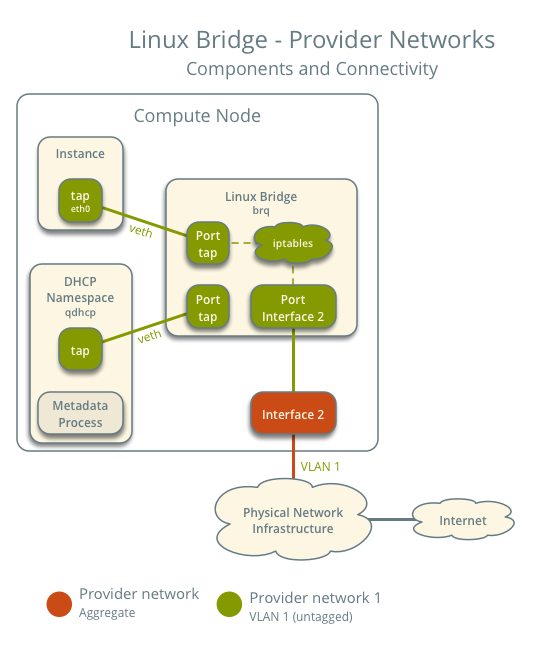 If the DHCP agent resides on another compute node, the latter only contains a DHCP namespace and Linux bridge with a port on the provider physical network interface. The following figure describes virtual connectivity among components for two tagged (VLAN) networks. Essentially, each network uses a separate bridge that contains a port on the VLAN sub-interface on the provider physical network interface. Similar to the single untagged network case, the DHCP agent may reside on a different compute node. 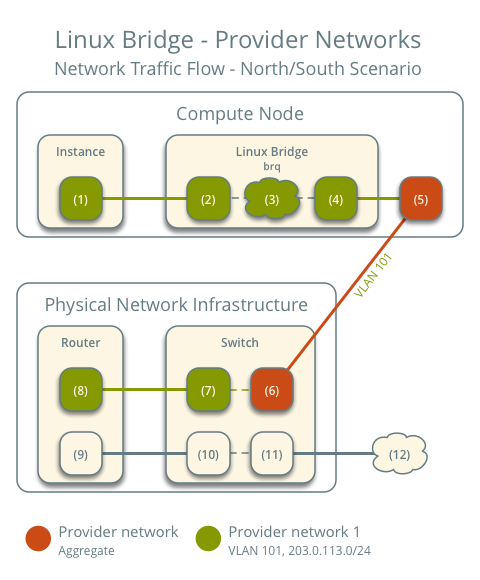 These figures omit the controller node because it does not handle instance network traffic. Use the following example configuration as a template to deploy provider networks in your environment. Install the Networking service components that provides the neutron-server service and ML2 plug-in. Disable service plug-ins because provider networks do not require any. However, this breaks portions of the dashboard that manage the Networking service. See the latest Install Tutorials and Guides for more information. Enable two DHCP agents per network so both compute nodes can provide DHCP service provider networks. The tenant_network_types option contains no value because the architecture does not support self-service networks. The provider value in the network_vlan_ranges option lacks VLAN ID ranges to support use of arbitrary VLAN IDs. 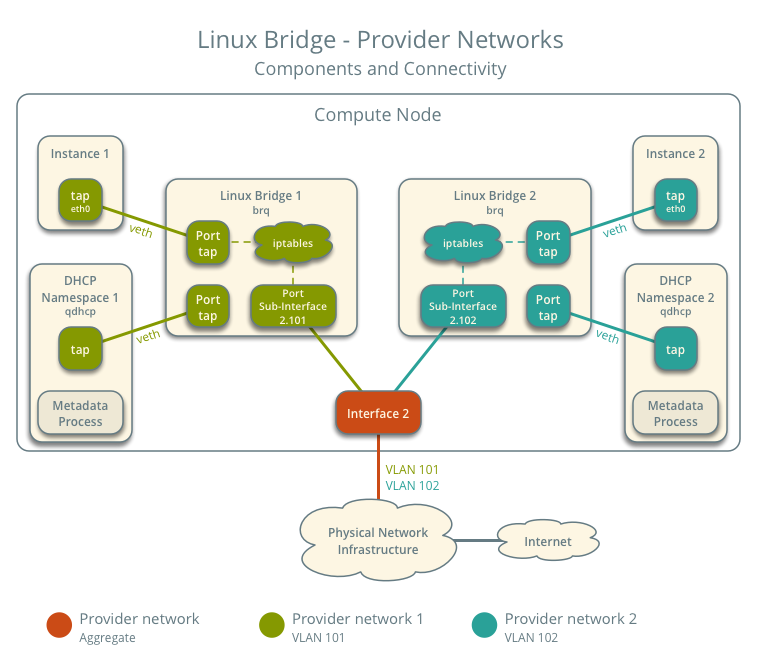 Install the Networking service Linux bridge layer-2 agent. The force_metadata option forces the DHCP agent to provide a host route to the metadata service on 169.254.169.254 regardless of whether the subnet contains an interface on a router, thus maintaining similar and predictable metadata behavior among subnets. The value of METADATA_SECRET must match the value of the same option in the [neutron] section of the nova.conf file. The configuration supports one flat or multiple VLAN provider networks. For simplicity, the following procedure creates one flat provider network. The share option allows any project to use this network. To limit access to provider networks, see Role-Based Access Control (RBAC). To create a VLAN network instead of a flat network, change --provider-network-type flat to --provider-network-type vlan and add --provider-segment with a value referencing the VLAN ID. Create a IPv4 subnet on the provider network. Enabling DHCP causes the Networking service to provide DHCP which can interfere with existing DHCP services on the physical network infrastructure. Use the --no-dhcp option to have the subnet managed by existing DHCP services. Create a IPv6 subnet on the provider network. The Networking service uses the layer-3 agent to provide router advertisement. Provider networks rely on physical network infrastructure for layer-3 services rather than the layer-3 agent. Thus, the physical network infrastructure must provide router advertisement on provider networks for proper operation of IPv6. On each compute node, verify creation of the qdhcp namespace. Launch an instance with an interface on the provider network. For example, a CirrOS image using flavor ID 1. Replace NETWORK_ID with the ID of the provider network. On the controller node or any host with access to the provider network, ping the IPv4 and IPv6 addresses of the instance. PING 203.0.113.13 (203.0.113.13) 56(84) bytes of data. The instance resides on compute node 1 and uses provider network 1. The following steps involve compute node 1. The instance interface (1) forwards the packet to the provider bridge instance port (2) via veth pair. Security group rules (3) on the provider bridge handle firewalling and connection tracking for the packet. The VLAN sub-interface port (4) on the provider bridge forwards the packet to the physical network interface (5). The physical network interface (5) adds VLAN tag 101 to the packet and forwards it to the physical network infrastructure switch (6). The switch removes VLAN tag 101 from the packet and forwards it to the router (7). The router routes the packet from the provider network (8) to the external network (9) and forwards the packet to the switch (10). The switch forwards the packet to the external network (11). The external network (12) receives the packet. 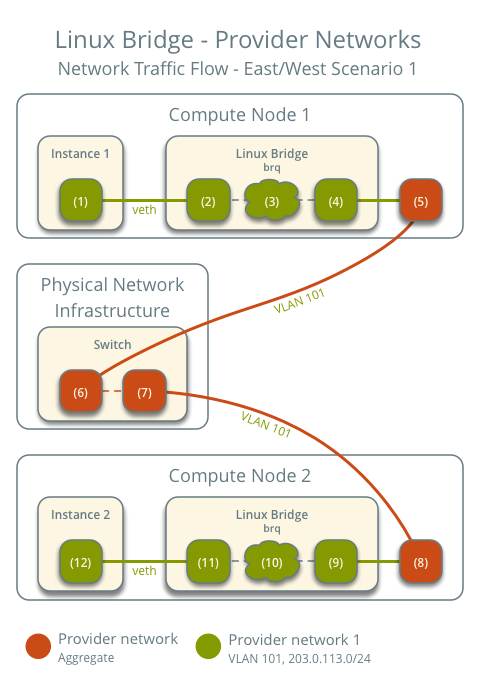 Instances on the same network communicate directly between compute nodes containing those instances. Instance 1 resides on compute node 1 and uses provider network 1. Instance 2 resides on compute node 2 and uses provider network 1. The instance 1 interface (1) forwards the packet to the provider bridge instance port (2) via veth pair. The switch forwards the packet from compute node 1 to compute node 2 (7). The physical network interface (8) removes VLAN tag 101 from the packet and forwards it to the VLAN sub-interface port (9) on the provider bridge. Security group rules (10) on the provider bridge handle firewalling and connection tracking for the packet. The provider bridge instance port (11) forwards the packet to the instance 2 interface (12) via veth pair. Instances communicate via router on the physical network infrastructure. Instance 2 resides on compute node 1 and uses provider network 2. Both instances reside on the same compute node to illustrate how VLAN tagging enables multiple logical layer-2 networks to use the same physical layer-2 network. The router routes the packet from provider network 1 (8) to provider network 2 (9). The router forwards the packet to the switch (10). The switch adds VLAN tag 102 to the packet and forwards it to compute node 1 (11). The physical network interface (12) removes VLAN tag 102 from the packet and forwards it to the VLAN sub-interface port (13) on the provider bridge. Security group rules (14) on the provider bridge handle firewalling and connection tracking for the packet. The provider bridge instance port (15) forwards the packet to the instance 2 interface (16) via veth pair.